Then I Got To Thinking...: Caprese = delicious! OMG how do you remember these recipes!? This looks sooo good!! And I have not had any lunch!!! Love caprese sandwiches. Simple ingredients coming together in such a delicious way. That looks SOOOO good! I am going to have to try that! Thanks for sharing! Oh yum! Those yellow tomatoes look so good too. This looks delicious. Take out the bread and stick a half piece of basil on top of each piece of mozzarella and you have another easy and delicious salad version of the recipe. Yum! First of all, I'm so impressed that you memorized this recipe! Second - it looks DELICIOUS! 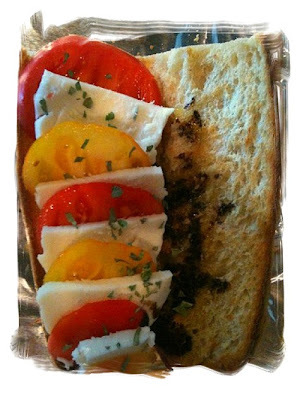 I'm not a huge tomato fan, but for some reason I like them with the combination of Mozzerella cheese and Balsamic! (Weird, right?). Seriously, it looks AMAZING! Thanks for sharing - I'm looking forward to making it for my family! Mmmmmmmm!!!! I will definitely do this!!! Yummmmy! I love caprese.. LOVE! Lovely! It's art! I'm so full right now from cheese and crackers that I can't even think of food. You're doing so well with your healthy alternatives. I love caprese salad - I am a sucker for motzerella cheese! So yummy and fresh! Beautifully displayed ... yummy too! this looks to die for...going to try it for sure!